BRING YOUR OWN BIKE and save $10! Price includes bike and helmet, an enthusiastic tour guide, lots of fun + free appetizer coupons from our Downtown restaurant partners! Please book at least 24 hours in advance as we cannot always accommodate last minute requests. Thank you! This price includes an enthusiastic tour guide, awesome bike + helmet, a souvenir plus free appetizer coupons from our Downtown restaurant partners. Bring your own bike and save $10! This tour is perfect if you are new to the city and you would like to see the most interesting spots of Pittsburgh. But if you know the Burgh already, we promise you that you will still find out unknown historical facts! Our "Best of": On this tour we will cruise through the streets of the Financial and Cultural district, explore the Strip District and check out the North Shore. We will find some details that some of you all drove and walked by hundreds of time but probably never really noticed. We will dive into the history of Pittsburgh, tracking down the people who shaped ﻿this ﻿city to what it is today: a beauty. Old and new buildings, city squares and public art will turn this ride into a unique event full of exciting (re)discoveries of The Burgh. A fun QUIZ will be part of this tour, too. The winner will be rewarded with a 30% discount at the next tour! Participants of this tour will also get a souvenir. PLEASE NOTE: No need to attend the ballgame to be part of this tour. It is a similar route than the Beauty of the Burgh Tour. Even if you are not going to the game, you will see the same sights, just in a different order. Those who go to the ballgame, will be dropped off near PNC Park/Heinz Field about 45-30 mins before the game starts. Other tour participants will be brought back to the starting point. 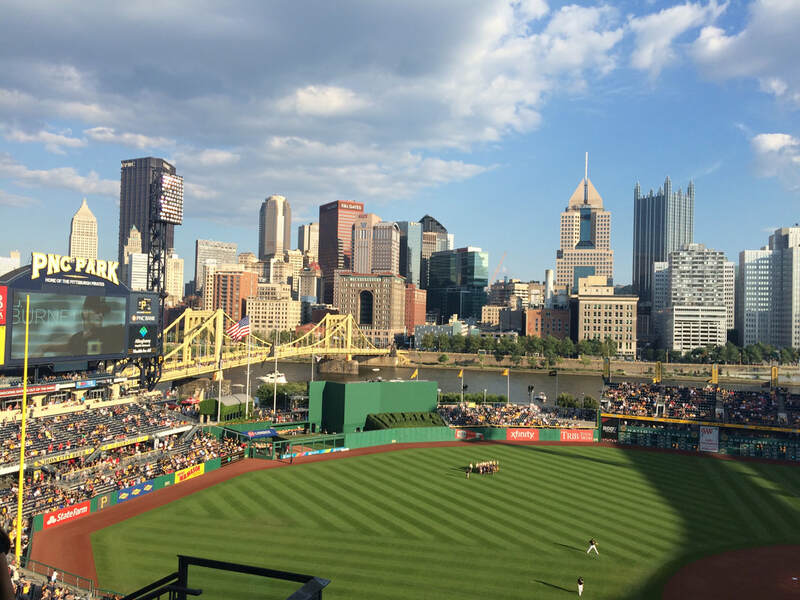 So let's first peruse the best parts of the city, and then bike over to PNC Park/Heinz Field to enjoy the game. The tour will cover the financial & cultural district of the Golden Triangle as well as the Strip (Market District) and end near the stadium. Get your exercise in before you will be sitting for hours. You will be dropped off at the ballpark in time, so that you won't miss the game and all the warm-up rituals. :-) No worries, you won't be sweaty as we will only be riding on flat territory. So, get your fan gear on and bike to the ballpark with us! Absolute best part: Everyone will get a free can of beer at the end! :-) Let's go, Bucs! or, starting in August: Go, Steelers! WHEN? on game days, please check the schedule by clicking on "Book this tour"
This price includes an enthusiastic tour guide, awesome bike + helmet, a souvenir and a can of beer. Bring your own bike (make sure to bring a lock) and save $10! 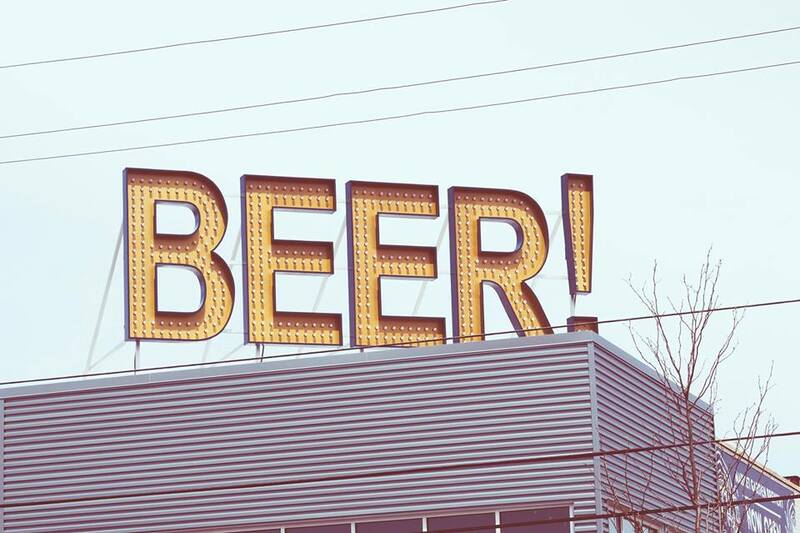 Join us on a ride around the historic districts of Deutschtown, Millvale, and Lawrenceville as we visit 5 of our favorite local breweries and learn about the past, present, and future of beer making in Pittsburgh, with an emphasis on how beer figures in the diverse communities of the Steel City. Your tour will be packed with lots of history, facts about beer making, and beer samples from each of the places we stop at. 21+ only, of course, and bring your IDs! This price includes an enthusiastic tour guide, awesome bike + helmet, one snack, a small meal and about 6-8 beer samples. Bring your own bike (make sure to bring a lock) and save $10! After getting to know the history of Downtown with its famous landmarks and personalities we will go for a ride on Pittsburgh’s Southside, the former center of glass and steel production in the United States. We will look for industrial leftovers and find places that make this diverse neighborhood so lively and beautiful nowadays. Watch out and listen carefully because the winner of our little, fun QUIZ will get 30% off the next tour! This price includes an enthusiastic tour guide, awesome bike + helmet plus free appetizer coupons from our Downtown restaurant partners. Bring your own bike and save $10! Get to know the "real Pittsburgh" outside of Downtown where Pittsburghers live and play! On this bike tour we will learn about the historical importance of Oakland as a new "city beautiful" with remarkable buildings. We will explore majestic relics of the former heyday of this area. The heritage of important Pittsburgh figures will be our focus while riding down the side streets along fabulous Shadyside mansions and dominating structures in up and coming East Liberty. Come on this journey with us because no one else tours in Oakland! START at Healthy Ride station on 4800 Frew Street in Oakland (close to Phipps Conservatory) - Attention! It is a different meeting point than at other tours! ​This price includes an enthusiastic tour guide, awesome bike + helmet plus free appetizer coupons from our Downtown restaurant partners. Bring your own bike and save $10! ​Ready, Set, Action! Explore original filming locations of big blockbusters as well as smaller independent movies and get to know the history of the actual landmarks you see in the various movie scenes! About a hundred years ago Pittsburgh was a city of movie making for a short period of time, before Hollywood took over. The result of this era are two beautiful theaters in the cultural district. Starting in 2007 our Burgh has come back as the new "Hollywood East" when Pennsylvania started giving tax credits to movie productions. Now the list of recent movies that were shot here is endless. Come and get inspired for future movie nights! We will discover some hidden treasures beyond the Allegheny river and get a good understanding of what the Northside, located across the Point State Park in Downtown, used to be. We will ride deep into the neighborhood and stop at historic sites, fascinating pieces of architecture and public art of various styles. LEVEL OF RIDING: Don’t worry: No Pittsburgh hills will be climbed! The tours will take place on the major plateaus of Pittsburgh, so everyone can attend, no matter what fitness level you have. We ride at a relaxing pace and won’t leave anyone behind. All tours will consist of moderate on-street biking, riding protected bike lanes and designated bike trails. BIKES: You can bring your own or rent a vintage-style city bike from us. If you take a tour, you'll get a special discounted price. We promise that you will fall in love with our bikes! More info here. TOUR START: All tours start and end on 1049 Penn Ave, Downtown Pittsburgh, PA 15222. Our shop is located in the David Lawrence Convention Center, opposite the Westin Hotel, next to Jimmy John's, right by the protected bike lane. PARKING: Half a block away from our shop is a parking garage at the Grant St Transportation Center: $7 for length of tour on weekdays, flat rate of $5 on Saturdays and Sundays all day. On-street parking is free on Sundays. PAYMENT: We generally suggest online booking in advance as weekends fill up pretty fast (payment via credit/debit card). If you decide to join the tour spontaneously, great! Simply give us a quick call ahead of time and pay cash or with card upon arrival. NEW TOURS COMING UP SOON! More interesting tours will be launched soon. Get the newest updates by signing up for our newsletter and by following us on Facebook or Twitter. Are you planning a family reunion, birthday party, bachelor(ette) party or corporate event? ﻿﻿Should ﻿﻿it be something very special and unforgettable? 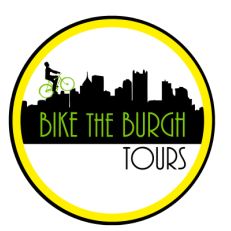 Then a bike tour with Bike the Burgh Tours is absolutely the right thing for you! 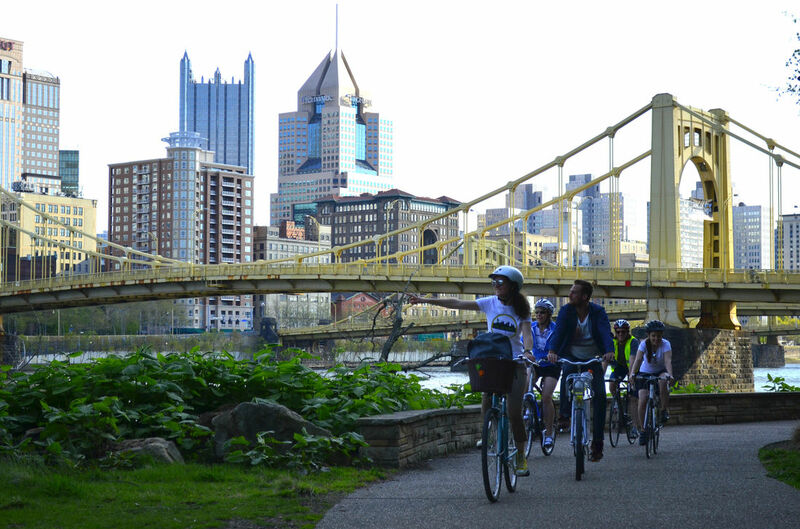 We offer a very unique and great way to discover Pittsburgh in a fun, active and sustainable way. For corporations, bike tours are great for team building, special events, and entertaining clients. For schools, we can assist in integrating our tours into an academic curriculum. We can either travel along the existing routes or tailor a special tour for you that covers your needs and preferences. Tour duration and tour route can be customized for up to 15 riders. As private tours can't be made online, simply give us a call or hit us up with an email at least 2 weeks in advance. Not a cyclist? No problem, we also offer walking tours through our sister company Walk the Burgh Tours! Looking for the perfect birthday, anniversary or wedding gift? Why not giving a memorable experience for 2018? Order your physical gift card now via email to mail [ at ] biketheburgh.com or phone 412-246-9494. Or get your virtual gift certificate by clicking on the button below!